The stability of the Yonex SHB 101 shoes is also a stand out point when compared to other shoes on the market. The stability is driven by a series of key technologies including the ergo shape shoe design, lateral claw stabilisers, and the power graphite lite insert in the sole. The ergo shape means the shoe is contoured to fit the foot better and reduce movement inside the shoe, ensuring better response and stability of the foot. The lateral claw stabilisers are supporting rods inserted in to the outer foot section of shoe to reduce lateral movement on landing, allowing for more transfer of power in to the next step. The Power Graphite Lite stability bar in the sole adds a lightweight but extra stiff support for the ultimate foot support, and reduction of movement. This means the foot is free to move and transfer power from step to step. The sole itself provides superior grip, by incorporating a hexagonal grip shape that provides 3% more gripping power and is 20% lighter than other soles. The round cushion sole reduces foot drag on stretch shots in particular, and added to the Elastic EVA and Double Russel Mesh provides a more lightweight and breathable shoe. Still one of the best court shoes around now going for much less than when they came out. If they are your first pair of court shoes then they are always going to hurt a little under the bridge (me and my friends found this when we bought ours around the same time) but after you're used to them they are so much better than trainers, you can never go back. Mine are over a year and a half old and the lack of grip on the soles is noticeable (ideally they should have been replaces six months ago) but they aren't that much less comfortable than when I got them. A must have for any keen badminton player. First up I have to applaud the excellent customer service after placing an online order with Sweatband. I asked for advice in view of previous foot problem and was given unbiased, honest information with no pressure. I've worn them for one match (after playing in oversize and unsupportive trainers for some time)but instantly felt more confident moving around the court. 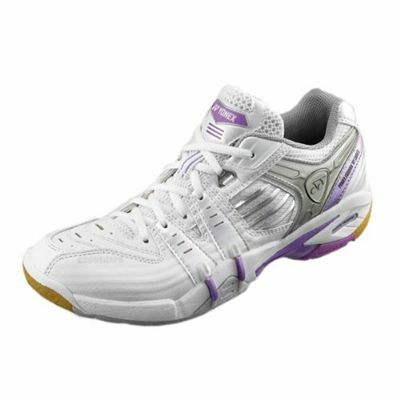 for submitting product review about Yonex SHB 101 - Badminton Shoes.